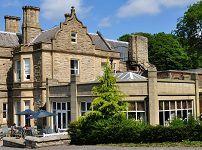 The restaurant at the Hollin Hall Country House Hotel has been given its own identity and offers quality meals every day from 12.30 to 9.30pm with lunches, afternoon teas and evening dinners. Brews: John Smith’s, Foster’s, Guinness plus extensive wine cellar. Food: Home cooked food using locally sourced ingredients wherever possible.